People living with dementia hold enormous creative potential; OMA (Opening Minds through Art) has been proving this since its introduction to the Club 36 Adult Day Program in May 2014. The program, originally developed at the Scripps Gerontology Centre at Miami University, is based on a growing body of evidence that art therapy improves the physical and psychological wellbeing of people with dementia. OMA breaks down generational and cognitive barriers by bringing together young and old in a unique collaboration that places the individual with dementia at the centre of the process. 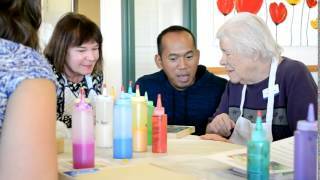 In this case, members of the Adult Day Program are partnered with nursing students from the University of Calgary, and the pair works together over a number of sessions. It’s a mutually beneficial partnership, from which meaningful relationships and learning opportunities emerge. “One of the most valuable learnings is that people with dementia may not remember who you are, but they will always remember how you made them feel,” says one Faculty of Nursing student from the University of Calgary. The nursing students, who first receive OMA training and dementia care strategies, work with their partner to gently guide and encourage their creativity to surface. The students learn how to work at a comfortable distance, eventually knowing when to provide support and when to step back and let the creative ‘flow’ take over. The process is broken down so that the person with dementia is given the opportunity to make manageable decisions at each stage; this alone can be an empowering and refreshing change from daily life. Bringing in nursing students from the University of Calgary was the brainchild of Ali Cada, Program Manager at the Alzheimer Society of Calgary, who initiated the program. “OMA provides the opportunity for people living with dementia to build their confidence, create meaningful relationships and strengthen their self-autonomy,” he says. Christine Foran, Nursing Practice Instructor at the University of Calgary, Faculty of Nursing, has observed her students’ personal and professional growth during the program. “As a nursing instructor, I am provided with the opportunity to witness the progression of students and the mastery in choosing different strategies to help clients get through difficult moments – from deciding to sit down and join the activity, to choosing different colours for their artwork, and interacting with other group members,” she says. Since its inception, many beautiful works of art have materialized from OMA. The resulting pieces are a testament to the fact that people living with dementia are capable of creative expression. Already, compositions can be seen on display at both Club 36 locations, in the Alzheimer Society of Calgary office, and at the various homes of artists and recipients. Now, OMA is now being taken out into the wider community to other Adult Day Programs, so that more Calgarians impacted by the disease can benefit from the program.